Pt.2 of mounting 5th gen 4runner wheels on a 2nd gen Tacoma. 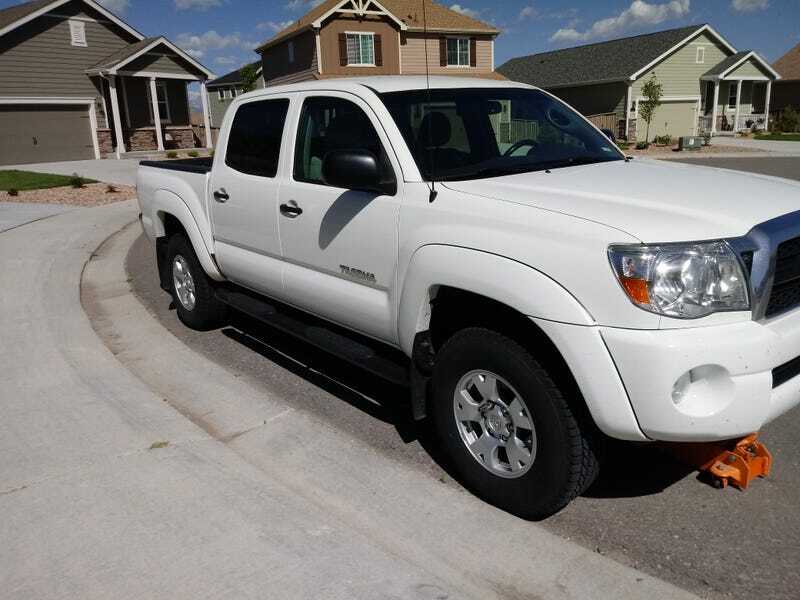 (Before pic with studable Firestone Winterforce LT’s) Yesterday I told of my Craigslist score and taco vs. 4runner wheel info. 4WD Tacomas use 16-17" six-lug wheels with a 30mm backspacing. 4Runners use the same size and width with 15mm backspacing. Otherwise, they’re the same wheel. So instead of getting black machined fake Beadlock pavement queen wheels that only work with Affliction shirts, twelve-inch lift kits, gold chains, and a UFC membership, take a look at factory options on www.hubcaphaven.com and see what factory options look good. Then hit up the craigslist. (After pic) Off with the full-on winters. On with the marshmallow Dunlop AT20 OEM tires. So we see the result (after I had to buy a 21mm deep socket to fit the lugs. 3/16 is too tight.) They stick out a half inch more than stock. (Nothing to worry about at all) The tire sidewalls of the 4Runner stock tires are only 0.52 inches more so the diameter is a whole inch more but that actually makes the speedometer read correctly. The other things people are worried about in doing this are rubbing and range of motion. Turned halfway...about a whole grown-up’s index finger space clearance. Turned full lock... More than a finger clearance. The front tires near mudflaps are the closest any of these tires come to rubbing anything, and that’s just a half inch closer than normal. By eyeballing the motion, there will not be any rubbing during suspension compression. Close? Perhaps but I’m not off-roading and if anything gets wedged up there between them then I’m somewhere I shouldn’t be with these tires. I checked the air after driving around a bit and they were WAY full....near 40. So I dropped them to recommended + a few more for the warm temps. $600 overall. What I got was new new new wheels pulled at 10k miles. new new new tires that hold a relative garbage rating on Tirerack for anything other than going down the dry pavement. But, that’s what these are for...98.6% of my life, excluding winter. Driving feels the same. The tires are softer and smoother and quieter. They’re just big fat car tires. I got 30,000 miles of these before they wear out. Then I’ll get something better.